Sailing in British Virgin Islands is a Caribbean paradise as you imagine it. An archipelago of 50 islands located close to one another makes for an eye-candy background for sailing. The hills are densely forested and white, palm fringed beaches welcome yachters to go ashore to find reggae bars, restaurants, fruit stands and smiling people. Coral reefs invite to snorkel and explore amazing underwater world and a year round pleasant water temperature allows to swim for hours. Islands are rich in bays where secure anchorages allow for a quiet night sleep. Constant trade winds fill the sails everyday and allow us to limit engine usage to the bare minimum and leave the soundscape to be filed with water flowing around our hull and the music we make on-board. Literally, every aspect of sailing holidays is polished to perfection in the British Virgin Islands. If you add to this list the fact that Caribbean rum has no equals, you know why this sailing holidays in the Caribbean route is called `Rumtastic`! Is the largest and most populated island on our route. We meet at the marina with fellow crew members and embark onto our yachts. There is a supermarket nearby to provision our yachts with all possible exotic fruits, local products and of course Caribbean Rum! Our marina is tucked into an inlet and a beautiful colonial-style houses with large verandas and colorful walls surround it. Fishermen sell their daily catch under the palms and an everlasting summer vibe eases us into the voyage ahead! Ahoy Rumtastic route! Ahoy Naleians! It`s going to be an an incredible time! Arrival from Tortola Airport to The Marina will take you only 15 minutes (7km). It really cannot be closer. Our first day sailing starts with an easy downwind sail towards remote Norman Island. Along the way, located just next to the Pelican Island, we visit `The Indians` which are two rocks resembling Native Americans. We snorkel at the coral reef around it which apparently is `better than in Disney movies`. After lunch and some relaxing on board we have a short sail towards one of the uninhabited bays where we spend the night. We drop anchor, go on shore and enjoy remote tropical beaches and at night stars above our heads! Sailing towards Virgin Gorda takes us along a few islands of the archipelago. Steady winds give an opportunity to refresh our skills at sailing maneuvers and we all start getting a golden suntan. Our lunch stop is at `The Baths` which are famous rock formations scattered along the southern part of the Virgin Gorda island. Strolling along this natural maze enchants and creates a perfect opportunity for some beautiful photos! The walk finishes at the Devils Bayso watch out! A short distance away is Spanish Town which is our destination for tonight. The ones who are into exploring rent scooters and drive to admire the sunset from Gorda Peak while the ones who prefer chilling, stroll the city, explore the bars and find a spot to spend the evening with some live music. Caribbean can only be enjoyed the way you like it! Leaving Spanish Town behind we sail further north along Virgin Gorda island arriving towards Little Necker for snorkelling, swimming and lunching. A coral reef surrounds this little island and a holiday resort is welcoming guests. It`s possible to go ashore for a little coffee if snorkelling is not your cup of tea. Afternoon sailing takes us to the northernmost part of BVI Archipelago: Anegada Island. A few restaurant onshore offer freshly caught seafood and fresh fruit cocktails. Apparently lobsters are their specialty! 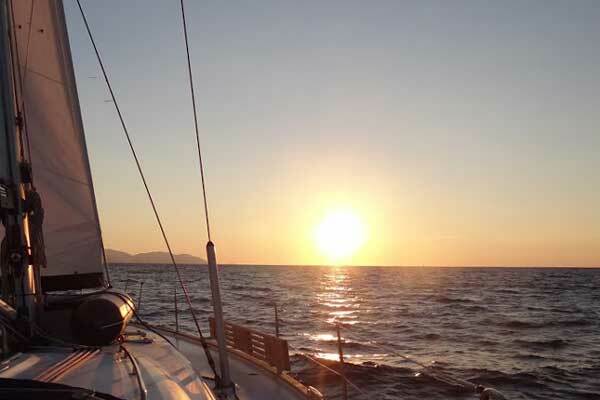 While we enjoy our meal, the sun goes down behind our yachts and at that moment we know we want to stay here forever! Guana Island is a little island north of Tortola which offers a beautiful, white, sandy beach, palm fringed seaside and a secure overnight anchorage. Once more we leave civilization behind and feel like explorers, discovering paradise islands. If we find driftwood, we lit a fire on the beach and enjoy the evening with guitars and singing. It`s a Rumtastic evening! We sail downwind from Guana island and we take it easy and slow, arriving to Sandy Spit for an early lunch. This sand spot has a self explanatory name. It`s a sandy spit with a little palm forest. The sea around is electric blue, yachts swell on the anchor and sunshine tans our skin. This spot may as well be a trademark of sailing holidays in The Caribbean. Sailing further south we arrive to Jost Van Dyke island where we drop anchor in front of a beach filled with reggae bars, restaurants and dancing spots. Fresh Pina Colada or Mojito anyone? While on Caribbean it`s a must to visit at least one rum distillery. We do so on the west side of Tortola Island where we have the distillery tour (as you see it will be short) and a rum-tasting session (as you can imagine it will be long ;)). With our rum stocks replenished, we visit another bay on the Jost Van Dyke Island and this time we experience the welcoming atmosphere on Foxy`s Tamarind Bar. It`s a unique Caribbean dance floor where we swing our hips to some happy tunes! As we are heaving to an end of our sailing holidays in The Caribbean there seems to be no better place to sail towards then the Bitter End. On our way there we visit Fallen Jerusalem. It is a beach filled with giant rocks and boulders that give an impression as if the walls of Jerusalem crushed just there. After a snorkeling session and a lunch we sail further to the Saba Rock where a cozy little cafe serves perfect refreshments. The night is either at the Bitter End Yacht Club or on the Pelican Island. You won`t guess which animals live there, will you? As it`s our last night out of the marina, it definitely needs to be next to remote beach. It is a tradition to make a cook-off where each boat of the flotilla cooks a meal and shares it with the other crews. Chef`s table while on a sailboat! Naturally the evening evolves later on it`s own , in an Rumtastic way! Addicting yacht life of our trip culminates and as always waves rock us to sleep and stars above are countless. Remember to bring your ABC snorkeling set. 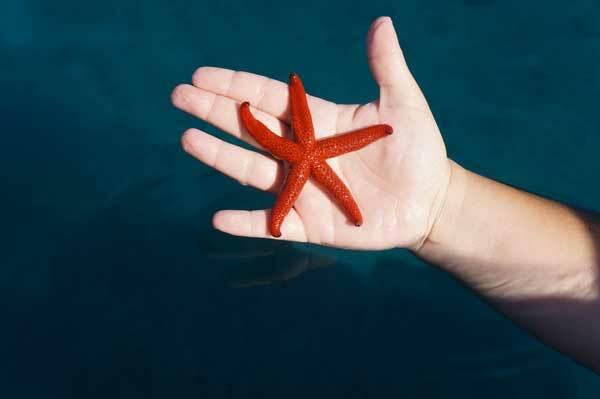 The Caribbean sea is full of marine life! We always have a regatta on Friday, the last day of our sailing holidays in the Caribbean. We put our newly learnt skills into use and you take the reins. Skippers do not help at all and the team has lots of fun and a little prize at the end! 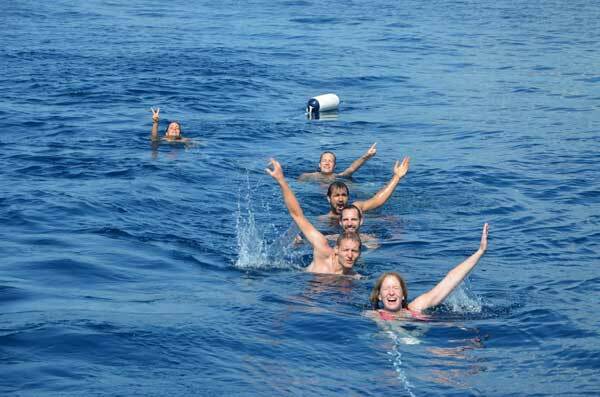 Join us for flotilla sailing holidays in the Caribbean! HOW MANY YACHTS WILL BE IN CARIBBEAN FLOTILLA? There won`t be more than 5 yachts in our Caribbean flotilla. This allows us to fit into small and uninhabited bays, moor at little restaurants and it makes the group small enough to have a cosy and friendly atmosphere that allows spontaneous ideas to come to life! For example: hiking the nearby hill to admire the sunset, going to a local concert or jamming on our yachts! Join Sailing Holidays In The Caribbean!